Our Town tells the story of the everyday lives of the citizens of a fictional American small town of Grover’s Corners through three acts: “Daily Life,” “Love and Marriage,” and “Death and Eternity.” Narrated by a stage manager and performed with minimal props and sets, this show is uniquely suited for our King Avenue sanctuary. 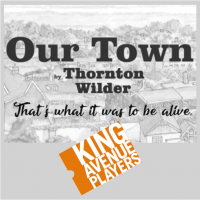 You won't want to miss this telling of Our Town, during its 80th anniversary of its Broadway opening. All performances take place at King Avenue UMC. Childcare will be available during the Friday and Sunday performances.